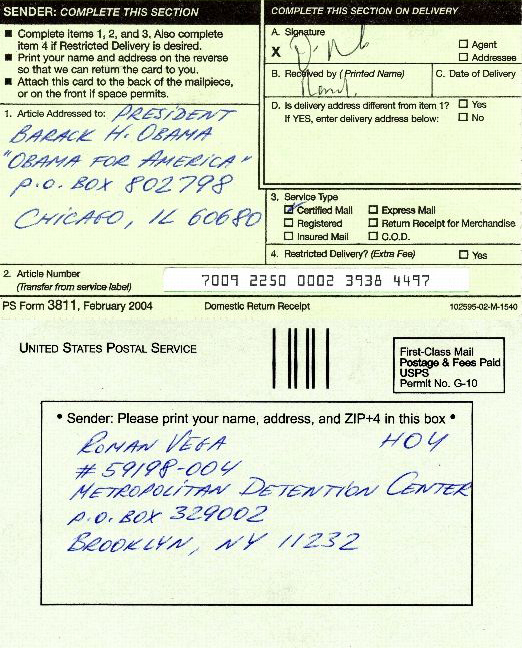 It was my 9th year of continuous incarceration, without having been sentenced yet by any U.S. court, when in May 2011 I received an unsolicited letter from President Barack Obama. Back then I was in the midst of a legal battle (which is not an easy task to conduct if one is locked in jail and fighting single-handedly against such a resourceful and soulless entity as the American government), while for years without any success having been trying to receive dental and medical care from my jailers: The Federal Bureau of Prisons. Therefore, I didn't have time nor desire to answer Barack Obama’s letter, which at the time slapped me as a very bad joke. Was it not a joke? After almost a decade of being locked up inside, without having been sentenced and being fortunate enough to witness all imaginable kinds of the U.S. government's injustices: lies, forgeries, shenanigans, intimidations by the agents and prosecutors, with the joy of invulnerability in their eyes; after more than enough encounters with the true methods of the U.S. government (which is hidden from public view), it is then that I received a letter from this country's President, in which he informed me that he had decided to go to reelection and that he was seeking my help by counting on my money. 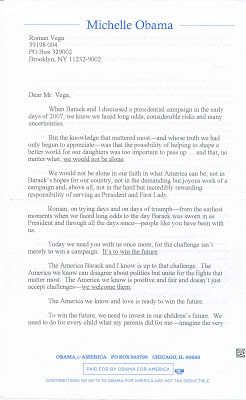 Barack Obama wrote in his letter: "We've come a long way together... Roman,... I am writing to tell you personally that I am running for reelection... Roman, this is that moment. This is the time to be in with me... Roman, I need you to be part of that movement. I know you've already answered that call. Now I need you to be in..."
I'm very much "in" already, so thanks, but no. In fact, I've been "in" for far too long. And so, Mr. President goes on: "I'm asking you to join me ... and to make an early commitment to Obama for America with a contribution of $100, $50, $25 or whatever you can afford today... I need you to stand with me. I hope you will with a generous contribution..."
Recently I stumbled upon a new book by David Maraniss named "Obama: The Story". David Maraniss reports that in high school, the future president was a leader of a group of potheads called "The Choom Gang" and frequently bogarted a joint. Perhaps that is a partial explanation as to why the President deems it fit and quite normal to beg money from prisoners. Meanwhile – as a result of some outside provocation – I had been placed into the segregation (Special Housing Unit) for a few months. During the course of my segregated confinement, my legal papers as well as Obama's letter were separated from me. 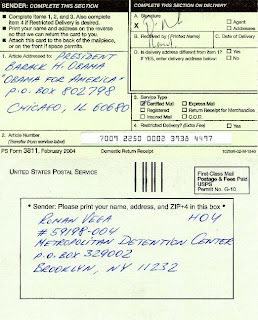 When an officer found Obama's letter among my paperwork, I was told that I was definitely prohibited to have such a thing in my possession, and that it is up to higher authority to decide on whether I, a Federal Bureau of Prisons inmate and non-U.S. citizen, would be permitted to keep their President's letter that had been clearly addressed to me. The officer's statements didn't phase me much, as Obama's letter was the last of my worries. I almost completely forgot about the whole business while juggling with many other more important things: defending myself in my New York case pro se (as one's own lawyer) within segregation – without access to law books and legal papers, and with only one short telephone call allowed per month; and just trying to get out of segregation or at least to obtain access to some of my legal papers. This country's "justice" makes Franz Kafka's "Trial" look like a work of inane apprentice. I marvel all these years on the perversed beauty of its internal clockwork. Brazil's Mayara Tavares at the G8 summit in L'Aquila, Italy. I forgot about Obama but seemingly he didn't forget about me. Shortly after I emerged from segregation in February 2012, I received the second letter from him, which had slightly different wording but carried the very same message as the first: "Roman, please send some money." Additionally, the message was reinforced by one more letter, now written by Michelle Obama. She was so kind that she sent a family picture together with her letter. In particular, she wrote: "The further you go, the further you have to reach back, and make sure you're pulling other people along the way... Roman, history proves we have an even stronger force on our side. We have you... 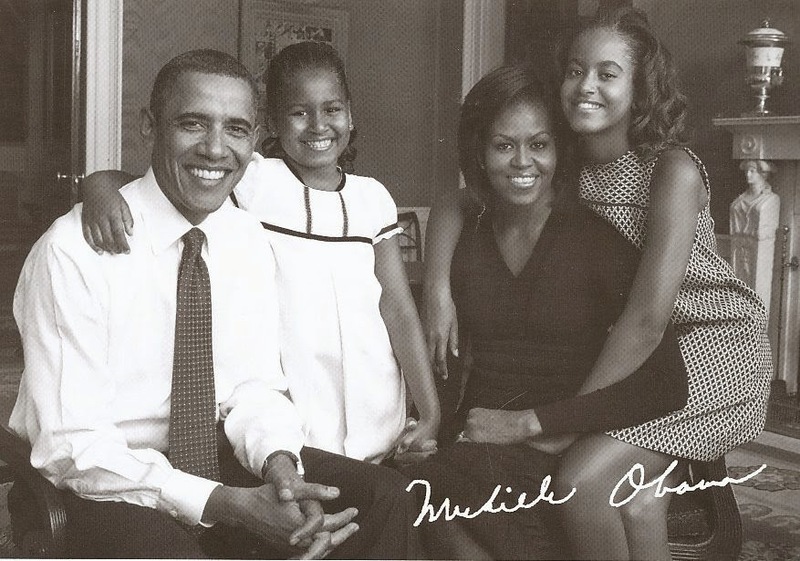 I hope we can count on you - to get involved in this campaign, to volunteer your time and talk to your friends and to send a generous contribution of $50, $100, $250 or whatever you can afford..."
Such marvelous persistency and determination of the Obama family I simply could not ignore any longer. It deserved to be awarded. 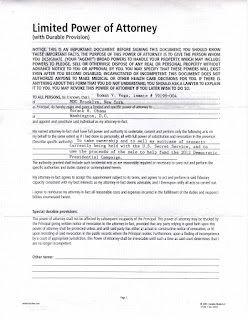 Therefore, I signed a Power of Attorney – to give Barack Obama the rights to my suitcase of belongings, which is the only property I still own (theoretically, because that suitcase has been stowed somewhere in the U.S. Secret Service's hands - the same hands that guard the President himself). Thanks for all your letters. I would be grateful if you could pass my thanks to your wife – I've received her letter as well. Your first letter was handed to me by our jail's guard on May 5, 2011, in the Metropolitan Detention Center, where, after a slew of other jails, your government has been keeping me pretrial, without sentencing, for soon-to-be a decade now. I beg your pardon for the delay in my reply. Your first letter reached me when, as a Federal Bureau of Prisons' inmate who is acting pro se (as a lawyer for myself), I had to complete some case-related legal paperwork before certain deadlines, besides the usual chore of having to make an effort to survive within the pandemonium of jail life. When, in November 2012 I was in the midst of sort of a temporary "legal doldrums" and was able, eventually, to give my full attention to your letter. I was placed into the SHU (segregation housing unit) for a few months and, in the process, was also stripped out of all my papers. It is interesting that when I asked the jail's officer for your letter, I was told that I am not permitted to have a letter from this country's President, and that it is up to the jail's lieutenant to decide whether I am eligible to have your letter, addressed to me, or not. So here we have an authority higher than the President. Fortunately, knowing from my decade-long jail experience that anything may happen, beforehand I sent a copy of your letter outside, so it did not disappear. Shortly thereafter I received a second letter from you, and afterwards a letter from your wife Michelle with a picture of your family. You wrote in your first letter, "Roman, ... I am writing to tell you personally that I am running for reelection for the President of the United States..." Thank you, Barack, for letting me know personally. Initially I entertained the thought that your letter was sent to me by mistake, but after rereading it thoroughly one more time and assuming that the President of the United States obviously must be aware of the documents and letters he signed and mailed out, and especially after I got your second letter, and the letter from your wife, such a thought of it being a mistake dissipated. 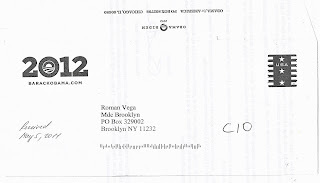 Furthermore, the addresses on the envelope as well as on the letter clearly indicate that you addressed this letter to me at my current jail: Roman Vega, MDC Brooklyn, PO Box 329002, Brooklyn, NY 11232, and all throughout the letter you address me by my name: "Dear Mr. Vega, we've come a long way together"; "You see, Roman, the truly great moments of progress in America have never begun at the top. They begin with people like you. "; "Roman, this is that moment. This is the time to be in with me." Naturally, if someone receives a letter that is unambiguously signed by the President of the United States of America, he must assume that the President knows very well of what he is doing and to whom he has chosen to write. So, let me assume that this is the case here, so allow me to thank you for your letters one more time. It truly made my day. Actually, it didn't just cheer me up a bit, but also elevated the mood of the other 119 prisoners in my jail's housing unit – who come from all over the world and are locked in together with me. We – you and I – have never personally met each other. But, so far as you obviously feel free to address me in your letter by my first name "Roman", it would only be fair if I would be able to do the same, right? So, Barack, you wrote: "Roman, I need you to be part of that movement. I know you've already answered that call. Now I need you to be in." In a way, I am very much "in", indeed. Unwillingly. Thus, your wish is granted, in a sense. In your first letter you went on to write that "we all believe in the rights enshrined in our Constitution." Sorry, Barack, but here where I am (even if it is on actual American soil and not in scalding Guantanamo or in one of the numerous CIA-operating secret prisons worldwide), we do not believe in such things as the abovementioned Constitution or "rights". Instead, we, incarcerated ones that make up more than two million nationwide, as well as our families, we know from our very own personal experience that today, the U.S. Constitution dwells on only as a figment of imagination in the political speeches, but not in everyday reality where it has morphed into nothing more than a desert illusion of an oasis - a mere dream which one may show to the bewildered and docile people and perhaps even make them believe in its existence. But they would never be able to approach it and drink from a glimmering brook in that luring, lambent oasis. So, Barack, these words about the "rights enshrined in our Constitution" sound to us as a mocking joke. Two and half million of us, as well as our families, harbor no illusions and see that in this country the word "constitution" became as empty from its original meaning as the other vogue doublespeak words which nowadays so many politicians and officials in the United States are prone to brandish enthusiastically, such as "freedom", "justice", "liberty", "democracy", "law", and "human rights". It doesn't' matter which of these words comes out of the mouths of today's American politicians, for invariably, we hear these words' real and only meaning as being "hypocrisy". "If truth-telling were a sin, they would be the very virtuous giants." There is some possibility though, that you and some of your coterie are sincere in your speeches. But you must know well that, as Oscar Wilde said, "The value of an idea has nothing whatsoever to do with the sincerity of the man who expresses it." Let's not forget that convicted Americans are very conveniently stripped of their voting rights, so why worry about them at all, right? It would be more promising to please the huge prison-workers' unions by sending more and more people to serve time in jails and prisons. For those of us who are locked inside the American prisons and jails, foreigners and Americans, for those of us who are placed in a position which makes it possible to behold not only window-dressed rosy facades of the Potemkin's village of contemporary US society, but its backstage as well, with all its unsavory machinery: its constantly hungry and forever-gulping law-enforcement/court/prison conglomerate's well-greased conveyor belt; its systematic and ongoing nefarious injustice which is ubiquitous in the system and veiled by institutional secrecy, – for us it remains crystal clear that in the United States nowadays justice has replaced law, law has been replaced by profit, slavery exists (yes, you read it right), constitution is not, and that, paraphrasing I.F. Stone's famous saying, "The government lies about everything." Such a sad but, alas, true story. My latest jail job did not pay very well, as the Federal Bureau of Prisons is not very generous to its slaves. I had been paid the usual B.O.P. inmate salary of $6 (six US dollars) and some change per month. Yes, you read that right – "per month". My responsibility was to run the law-library at the Federal Detention Center in Dublin, California. By the way, did you know how much an inmate has to pay if he wants to make an international telephone call from entrails of the Federal Bureau of Prisons? Let's say, to Kenya or Indonesia. Almost a dollar per minute: 99 (ninety-nine) cents. Yeah. There are no alternatives, as keeping such a super-lucrative profit margin requires an absolute monopoly. You may think I'm writing about Zimbabwe some 20 years ago? No – I'm writing about what is happening today in the United States of America. Thus, my monthly salary was only suffice for one 6-minute telephone call home, that is, if in that particular month I didn't need to buy toothpaste, soap, or postage stamps, let alone have any other ideas about shampoo or food. This is why, dear Barack, I do not have any savings of which I may part with for your behalf. My 70-year old mother in Crimea ekes out her existence on a mere pittance, and by planting a few pails-worth of potatoes on a small strip of land every spring – in hopes that the weather will be auspicious enough for autumn to yield some crop. If it does, then she will survive through another winter. If not, then she will be in the total mercy of friends, who I hope will help her. Thus, there is no money for you in Crimea either, Barack. I might be able to ask my mother to part with a pail or two of potatoes on your behalf, but she has no money to mail it from the Simferopol to Washington, D.C. So, regretfully, my family is unable to help you even with that. Sorry. The United States took away my freedom, sunlight, fresh air, justice, as well as the possibility to see my mother who I haven't seen for years (due to the US Embassy's denial of her entry visa). Your country has deprived me of my health and even my teeth. The United States District Court holds six of them now, so what would it matter if on top of all that I choose to give to the President of the United States the remainder of my scarce personal possessions? It wouldn't be difficult for you to access them, for your own Secret Service holds all of what I own, all of what they found during the course of their rigorous 9-year worldwide investigation: a Samsonite suitcase with some personal belongings inside: a wristwatch of an obscure brand; undergarments, some casual clothing articles, a toothbrush, and a few books in Russian. Along with this letter I've enclosed a Power of Attorney which grants you the rights to all of these items held with the Secret Service. They are now yours – to either keep or sell on eBay or elsewhere, which would probably help you fetch the amount you and your wife have asked me for. Perhaps the items within my (which is now your) suitcase have become a bit stale after many years of having been stowed away somewhere in the U.S. Secret Service warehouse. But, it's all I have now, Barack, so take it all. I've never denied my help to those in need who've asked for it. For instance, back in 1991, as the U.S.S.R. crumbled, I was asked to help the then up-and-coming first Russian President Boris Yeltsin. I did what I could, Yeltsin eventually became a President. However, I never even received a "thanks" from him. But, strangely enough, I was awarded – amongst other unsolicited kudos – "for heroic defense of the Russian democracy" by none other than the American organization "The National Society of the Sons of the American Revolution". Years later I was asked to provide some other form of assistance to the erstwhile President of Ukraine. Again, I did what I could, and again, I didn't even get a simple "thanks" from the President. Instead, all I got was a bunch of problems from some of his influential frenemies. So, as you can see, Barack, my small experience so far tells me that such is the real nature of presidential appreciation. An excellent but obscure American novelist James Branch Cabell once wrote: "By every rule of tradition, the third attempt is invariably successful". Thus – and though by now I would be quite indifferent to it – there is a likelihood that I would at least get a "thanks" from a President. May my meager support help towards your reelection, in order to hold onto the reins of power, if such is your deepest wish – as you described in two of your letters. You have a deepest wish; you asked for help; and I did for you what I could in my current circumstances. My wish is not for real, sane justice, as opposed to a prosecutorial American-style parody on it. I perfectly understand that in these times such a wish in this country is unreachable - even for a President. My wish is not for medical treatment, which I've unsuccessfully sought since 2007. With so many prisoners and too few doctors in the Federal Bureau of Prisons how could it be so otherwise? My wish is not even about peace all around the world. I know that it is impossible in our current rotten world. My wish is of the simplest kind: I wish my teeth to be restored to their natural state in which they were before U.S. marshals brought me to American soil in 2004. After years of unsuccessful attempts to get dental treatment from the Federal Bureau of Prisons, I even mailed some of my fallen teeth to the Judge, which, eventually, prompted a short visit with the Federal Bureau of Prisons dentists. The dentists said that the Bureau of Prisons lacks the funds to allocate towards such treatment. Instead, one of the dentists recommended me to sign whatever prosecutors want and to receive the sentence, as the only way to reach my "final destination", to prison, where I "may get some treatment". Another dentist was in a jollier mood: instead of treatment, she promised to pray for me. Either she reneged on her promise or her prayers were not sincere enough, for I never woke up with a fresh set of teeth. Barack, it is very difficult to chew when one has only a scant few broken teeth remaining in his mouth. I admire your smile in the picture which your wife sent to me. I do believe that you have the best dentist which a Presidency can possibly buy. nec scire utrum sis albus an ater homo." P.S. I almost forgot to tell you that if – as a result of this my reply to your letters – there will be (who knows?) any kind of repressions towards me from the Federal Bureau of Prisons (as to: placing me into a Segregation/Special Housing Unit, confiscating my papers, abruptly moving me to another jail, or somehow curtailing my communication with the outside world) – on some or other fabricated pretext, but nevertheless as direct result of my reply to your solicitation, I will notify you thereof. Actually, this is going to be a very interesting test of this country's idea of freedom of speech. There is a Chinese proverb: "He who rides a tiger is afraid to dismount." Sir Winston Churchill paraphrased it in 1936 in his "Why England Slept", so I will take the liberty to slightly paraphrase Churchill: "Presidents ride to and from upon tigers which they dare not dismount; and the tigers are getting hungry." "King Janaka once dreamt that he was a beggar. On waking up he asked his Guru – Visishta: "Am I a king dreaming of being a beggar, or a beggar dreaming of being a king?" The Guru answered: "You are neither, you are both. You are, and yet you are not what you think yourself to be. You are because you behave accordingly; you are not because it does not last. Can you be a king or a beggar for ever? All must change. You are what does not change. What are you?" Legal nook: Ruling on Hamilton v. Hall "should be a clear sign that limiting or restricting the speech of people in jail is illegal," said Benjamin Stevenson, staff attorney for the ACLU. "It's equally important to remember that free speech rights work both ways - the government can't restrict your right to speak to others or restrict the way you receive information." Music: Dire Straits "Money for Nothing"
I recently received a letter from a friend of mine who has been in MCC Manhattan for years, without being sentenced. He wrote: "As an American citizen programmed through his life in believing that everything affiliated with "The United States of America" should stand for justice and human rights, I would never before have imagined how I'd be left languishing for six years so far, in legal limbo, and under the most cruel and harsh conditions I could ever think possible to exist right here on our very won soil. It astounds me how I am continuously, shamelessly denied even the most basic components such as: sunlight, fresh air, and proper medical care. Furthermore, the day to day rigor of just basic survival has been oppressive, and the sheer volume of negative-emotional contagion debilitating to my psyche. Recently I had the pleasure of reading Naomi Klein's "The Shock Doctrine: The Rise of Disaster Capitalism." She eloquently argues that Milton Friedman and his "Chicago Boys" use countries as a laboratory for testing economic theories via "shock therapy." This leads to torture and genocide of hundreds of thousands, political and economic collapse, currency devaluation, and sovereign and domestic debt default; ultimately leading to wealth and success of "corporatism." Ms. Klein traces the history of Friedman's free market economic theory, a.k.a. neoliberalism, from its imposition on authoritarian regimes in Chile, Argentina, Bolivia, and Brazil (in the 1970's - 80's), through Poland, the Soviet Union, and South Africa (in the 90's), to the modern day focus on the Middle East. With graduate and professional degrees in law, finance, and economics, I am versed in economic/geopolitical factors and policies affecting emerging or financially distressed nations. I know of the subversive actions by the powers that be (e.g. governments and financial institutions). However, this masterpiece awakened me and made me realize how little I truly know. Through facts, not theory, she provides the missing links from CIA's electroshock experiments in the 1950s, to the economic shock experiments of various countries, to current day shock treatment in the United States. Though I am an American and lived in New York, through 9/11, I did not know the extent of the privatization of the police state and how the new growth industry, the disaster economy, has become bigger than the dot.com boom in the 1990s. Although some parts of the book may be disturbing, it is a must read. to read content from other authors and practice something from other sites.